All Julian can think about is the three fabulous women he's seen, dressed like mermaids, and how to make his own sparkling costume. But what will Nana think about the mess he makes – and what will she think about how Julian sees himself? Mesmerizing and full of heart, this is a picture book about self-confidence and love, and a radiant celebration of individuality. While riding the subway home with his Nana one day, Julian notices three women spectacularly dressed up. Their hair billows in brilliant hues, their dresses end in fishtails, and their joy fills the train carriage. 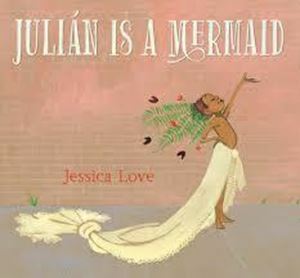 When Julian gets home, daydreaming of the magic he’s seen, all he can think about is dressing up just like the ladies and making his own fabulous mermaid costume. But what will Nana think about the mess he makes – and even more importantly – what will she think about how Julian sees himself?